Am. João Mira Gomes is the Portuguese Ambassador in Berlin and graduated from the Portuguese Catholic University in Law. Since 2010, he has been a full-rank Ambassador, and a permanent representative on the North Atlantic Council. Political relations between Germany and Portugal are trustful and characterized by frequent mutual visits and a broad agreement on issues relating to foreign and security policy. Germany was fundamental in the building of democratic structures in Portugal after the 1974 Revolution, and supported Portugal’s 1986 accession to the European Community. Germany and Portugal were among the founding members of the Eurozone in 1999/2000, and nowadays, there is a German-Portuguese Forum, which has occurred annually since 2013, alternately in Berlin and Lisbon. In this Forum, high-level representatives of the two countries’ political, business and scientific sectors meet. 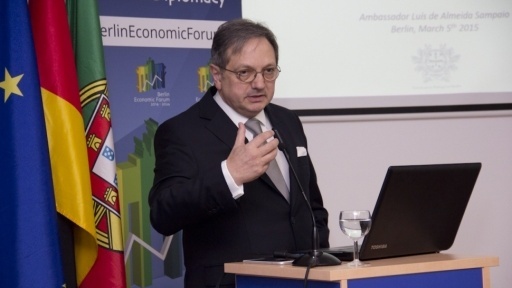 The fourth German-Portuguese Forum is to be held in Germany in 2016. On an economic level, Germany is Portugal’s second most important trading partner, completing approximately 13% of both Portuguese exports and imports. German companies have had their own production facilities in Portugal for over a century, and continue to rank first among investors in the country’s industrial sector. Portugal is a popular tourist destination for Germans. The number of visitors from Germany grew by 10 per cent in 2012 and around 8 per cent growth in 2013. The cultural bond between these two countries is also strong, especially when it comes to education. This is evidenced by the two prestigious binational German Schools in Lisbon and Porto, which are attended by a total of approximately 1,700 mainly Portuguese students; the Goethe Institute; and a host of university partnerships. The interest from Portuguese students in learning the German language has grown in the last years, as well as in classical and contemporary German music; contemporary German literature and philosophy; art, design, theatre, dance and cinema. Conversely, there is a market in Germany for contemporary Portuguese literature and interest in Portuguese productions (including films). In addition to the Embassy in Berlin, Portugal has four other representations in Germany. These representations include consulates in Dusseldorf, Stuttgart, and Hamburg.